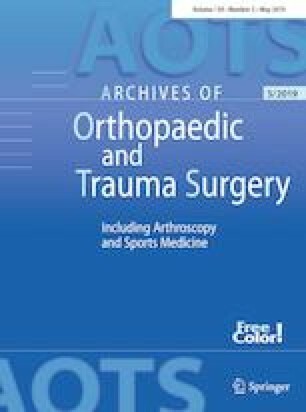 Limited data exist on patient safety after simultaneous vs staged bilateral total knee arthroplasty (TKA) in matched groups. Hence, the aim of this study was to compare length of stay (LOS), in-hospital complications, 30-day readmissions and mortality after simultaneous and staged bilateral TKA in matched patients. A retrospective case–control study of prospectively collected data in nine centres from February 2010 to November 2015. Propensity scores (PS) were used to match simultaneous and staged (1–6 months between stages) bilateral TKA patients with prospectively collected patient characteristics from the Lundbeck Foundation Centre for Fast-track THA and TKA Database. 30-day follow-up was acquired from the Danish Patient Registry and patient records. A total of 344 (47.1%) simultaneous and 386 (52.9%) staged bilateral TKA procedures were performed. PS matching was possible in 232 simultaneous and 232 staged bilateral TKA patients. LOS was median 4 days (IQR 3–5) after simultaneous and cumulated 4 days (IQR 4–6) after staged procedures. The in-hospital complication rate was 15.5% after simultaneous vs 7.3% (p = 0.004) after staged procedures. Two cases (0.9%) of venous thromboembolic events were found in each group. Eight patients (3.4%) were re-operated after simultaneous vs one patient (0.4%) after staged bilateral TKA (p = 0.037). The 30-day readmission rate was 8.6% after simultaneous vs 5.6% after staged procedures (p = 0.281). No patients died in either group. We found no significant differences in 30-day readmission rates and mortality between simultaneous and staged bilateral TKA, but the in-hospital complication rate and re-operation rate was higher after the simultaneous procedure calling for further matched investigations in larger cohorts. The members of the Lundbeck Foundation Centre for Fast-Track Hip and Knee Replacement Collaborative Group are given in the acknowledgement section. We thank the staff at the nine centres for the assistance with fulfilling of preoperative questionnaires from the patients. The study was sponsored by a grant from the Lundbeck Foundation (grant number: R25-A2702). The Lundbeck Foundation Centre for Fast-Track Hip and Knee Replacement Collaborative Group consists of: Frank Madsen, Department of Orthopedics, Aarhus University Hospital, Aarhus University, Aarhus, Denmark; Torben B. Hansen, Department of Orthopedics, Regional Hospital Holstebro, Aarhus University, Aarhus, Denmark; Søren Solgaard, Orthopedic Department, Copenhagen University Hospital Gentofte, Copenhagen University, Copenhagen, Denmark; Mogens B. Laursen, Orthopedic Division, Aalborg Hospital, Aalborg University, Aalborg, Denmark; Lars T. Hansen, Orthopedic Department, Sydvestjysk Hospital Esbjerg/Grindsted, Esbjerg, Denmark; Per Kjærsgaard-Andersen, Department of Orthopedics, Vejle Hospital, University of Southern Denmark, Odense, Denmark; Lars P.Jorn, Orthopedics Department, Viborg Regional Hospital, Viborg, Denmark and Jens Bagger, Department of Orthopaedic Surgery, Copenhagen University Hospital Bispebjerg, Copenhagen, Denmark. The study was sponsored by a grant from the Lundbeck Foundation (Grant number: R25-A2702). No benefits in any form have been received or will be received from a commercial party related directly or indirectly to the subject of this article. No conflicts of interest were declared from the authors of this study.